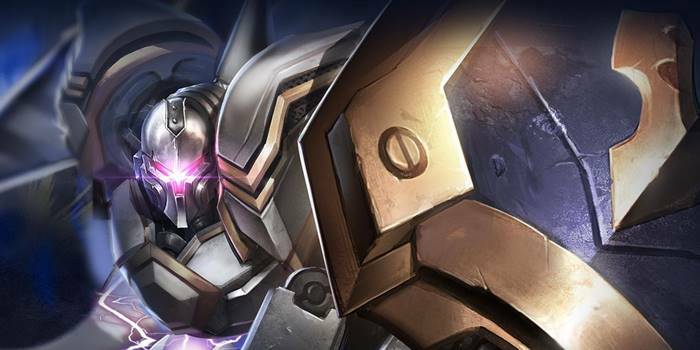 An guide to Arena of Valor's Omega, the Awoken Mech. Omega is a tank who disrupts enemy teams and tears down towers with his large area abilities. Omega is a tank hero that is tailor made to tear down towers quickly and efficienly. Using its abilities, the awakened mech can stun structures to safely attack underneath or zoom around the battlefield. It also has a lot of control abilities that can keep enemies in place during team fights. Strong Pusher – Omega’s passive allows its abilities to damage towers. Furthermore, all of its abilities do damage to an area, making it capable of quickly destroying minion waves as well. Ganking Capabilities – Omega also has a lot of control abilities that are well suited to ganking. Its Guardian Mode lets it close in on enemies and can open up opportunities for your team to nab kills. Speedy – Guardian Mode provides Omega with a sizable movement boost, allowing it to traverse the map very quickly. This can aid when split pushing by making it easy to retreat or move to unoccupied lanes. Clunky Animations – One of the quickest way to kill a hero’s potential is when their animations get in the way. This is sadly the case for Omega, the knock up from Guardian Mode requiring a rather elaborate animation before stunning. This allows enemies a lot of time to retreat and puts a lot of pressure on Omega when it comes to positioning. Team Dependent – Omega has mediocre damage on its own and needs to get close to enemies to be effective. As a tank, it needs allies with more reliable damage in order to succeed. Due to its potential when it comes to split pushing, Omega is best suited to the Slayer lane. Alternatively, players could use its wealth of control abilities and high speed to take the role of a support. Spam your abilities on towers as much as possible. The damage and stuns they provide will make it very easy to quickly knock structures down. You can try diving the enemy by stunning their tower with either Guardian Mode or Crash Mode. However, you should only do this if the enemy has critical health and can be dealt with in one blow. Level up Guardian Mode first and use it to harass the enemy whenever possible. You can also use it when the enemy jumps on you to mitigate some of their damage. Don’t use Guardian Mode and Crash Mode in quick succession. Instead, wait for the first stun to end before following up with the second. This is to maximize the amount of time the enemy will spend stunned. b>Solo Fights – Initiate the gank with Guardian Mode to quickly get close and knock the enemy up. Follow up with Crash Mode as soon as the first stun ends. Use exterminate for a steady stream of damage to try and finish the target off. Team Fights – Focus on hitting squishy heroes in order to create chaos among the enemy team. Your AoE abilities are well suited to team fights, so use them often to stun multiple enemies. Use Exterminate when enemies have clustered around you to damage everyone nearby. Escaping Fights – Use Guardian Mode whenever you find yourself in a difficult spot. Stunning the pursuer with Crash Mode will give you some extra time to run away. Split Pushing – Demolition Mode allows you to destroy towers with ease. If you find yourself in a comfortable spot, coordinate with your team to draw the enemies’ attention to one side of the map. After the enemies start to show up to protect that lane, start pushing down the lane on the opposite side. This will give you some time to push uninterrupted before any enemies can reach you. In addition, the enemies will be forced to split up in order to deal with both you and your allies at the same time. Mastery of this technique can allow your team to push down several lanes at the same time. Demolition Mode – Passive – Omega’s abilities deal full damage to structures. Omega can tear down towers incredibly quickly thanks to this ability. It also lets abilities damage the enemy core. Demolition Mode also allows you to stun towers with Guardian Mode and Crash Mode. Harassing the enemy under their tower is a good way to chip away at the tower’s health. The stuns that Guardian Mode and Crash Mode provide will give Omega some time to get out of its range before drawing the tower’s fire as well. Guardian Mode – When activated, Omega gains a damage absorption shield and increases movement speed by 25/30/35/40/45/50% for 3 seconds. The next normal attack deals 180/210/240/270/300/330 (+1 AD)ˀ physical damage, knocking targets into the air briefly. Guardian Mode is your means of initiating, the movement speed allowing Omega to get close before knocking the opponent into the air. Guardian Mode can also act as your escape ability. The shield and movement speed remain even after using the empowered attack. The empowered attack is available for five seconds. The shield does not scale with any of Omega’s stats, starting at around 400 points at level 1 and increasing by about 100 points per level. Crash Mode – Omega charges forward, dealing 330/370/410/450/490/530 (+1.4 AD) physical damage to enemies and stunning them. Crash Mode can stun multiple enemies inside the cone. Wait until Guardian Mode’s stun has worn off before using Crash mode to maximize the stuns’ length. You can use Exterminate while Guardian Mode is active. Exterminate will continue to damage foes while Omega is stunned. Don’t leave Omega in a lane because it can quickly take down towers with its abilities. Be aware of the map and anticipate to where it might split push next. Try to avoid or kite Omega when it uses Guardian Mode. You will get stunned once it successfully hits this ability. Also, Omega has another stun that can stop you even further from doing anything. Omega is hard to play due to the fact that you really need to get close to the enemy in order to deal damage. Because of this, getting it defensive arcanas such as Indomitable, Benevolence, and Mythril greatly helps it mitigate some damage and increase your chances of surviving a team fight. Building Omega offensively is also viable, provided that it has adequate help from its allies when it comes to initiating team fights. Get Onslaught, Assassinate, and Skewer for this arcana set. This match up will be a stalemate, as neither Omega nor the enemy tank will be able to do significant damage to the other. Just wait for an ally to assist you by attacking while you pile on stuns. Warriors can pose a threat in extended fights, able to absorb your meager damage while dishing out more respectable amounts of their own. You will again need the help of a mage or marksman to take them down while you supply control effects. Assassins are easy targets, Omega able to use Guardian Mode and Crash Mode whenever they try to jump it. Their low defenses will make them rather weak to Exterminate as well. Wait for them to approach before punishing their aggression with a combo. Many mages will be able to pierce your defenses with their magic damage and control effects. Getting close will be an issue, their control abilities able to counter the movement Guardian Mode provides. That said, mages are very weak to foes that have managed to get close to them. Be careful when dealing with marksmen, especially those with control abilities like Valhein and Slimz. These champions can easily kite and kill you from a range. They need to be focused in team fights, however, so do your best to get close and stun them. Marksmen are very squishy and thereby weak to nearby enemies. Omega can turn team fights around when it gets a hold of the enemy’s support. Its control abilities can suppress the support, rendering them useless to the team. As an Omega, supports are one of the most important targets to go after in a team fight. You forgot that omegas guardian mode knock up is faster with attack speed. Maybe 1 or 2 attack speed items and/or arcana could help very much hit the stuns and escape with them for example take war boots and omni arms if you go offensive or maybe keep frost cape and take maybe blitz blade because it gives some extra attack speed, damage and movement speed to him so its maybe pretty good on him.